Hosted by: Barbara Cole, Curator of Outdoor Art, Morris and Helen Belkin Art Gallery and Naomi Sawada, Manager of Public Programs, Morris and Helen Belkin Art Gallery. Have you ever wondered how works of outdoor art are selected and produced? Since the late 1940s, the University of British Columbia’s Outdoor Art Collection has captured the imagination of visitors from around the world about diverse topics such as land development and environmentalism, our relationship with First Nations, and how we picture our past and future. 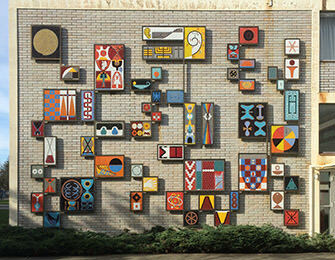 There are over 24 works of contemporary art across campus. Join this special Behind-the-Scenes walking tour and discussion with Barbara Cole, Curator of Outdoor Art and Naomi Sawada, Manager of Public Programs. They’ll talk about selected works of art, what’s involved before and after an artist is approached, the role of the curator, how an artist’s ideas are developed and influenced by the larger University organization, and how visitors experience the works after they’re installed. Wear comfortable shoes. In case of rain, bring your umbrellas!